«Climate change and adaptation» was a central topic in the 5th World Water Forum. It was the lead theme for the political and thematic processes, the topic of a High Level Panel session, and a focus in several documents and sessions of the regional processes. To provide background and depth to the political process, thematic sessions and the regions, and to ensure that viewpoints of a variety of stakeholders are shared, dozens of experts were invited on a voluntary basis to provide their perspective on critical issues relating to climate change and water in the form of a Perspective Document. Led by a consortium comprising IWA, the Co-operative Programme on Water and Climate (CPWC), the World Water Council and IUCN, the initiative resulted in the series of papers presented here. 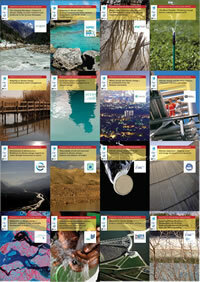 For ease of adding future Perspectives to the series, the documents were made available on a USB stick that was handed out during the 5th World Water Forum in Istanbul. The Perspective Documents cover a total of sixteen issues, but the Series is not intended as a comprehensive overview of all possible perspectives related to water resources management and climate change adaptation. Inviting several institutions to write on this topic triggered a process that ultimately served the contributing organizations themselves. Many of them are now using the Perspective Documents internally to shape their strategic position within the climate change adaptation debate, and to help focus and strengthen their thinking on water-related adaptation policies, strategies, actions and objectives. As a series, the documents aim to define and distill the critical role of water in climate change adaptation and to lay out strategic and operational priorities for adaptation of water management and services. The series increased the understanding among sectors and catalyze dialogue, awareness, and commitments at multiple levels and across individual interests. Furthermore, the series served as a contribution to the dialogue and debate on climate change adaptation underway in preparation for the 15th Conference of the Parties under the United Nations Framework Convention on Climate Change (UNFCCC COP-15) in December 2009, and in subsequent climate change negotiations.